Bash Bish Falls State Park is a Massachusetts state park located in the town of Mount Washington. The park is named after Bash Bish Falls, Massachusetts' highest single-drop waterfall (60 feet (18 m)), which lies within its borders. 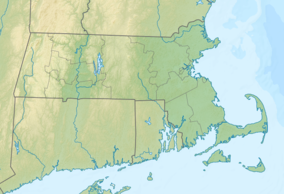 The park is managed by the Department of Conservation and Recreation and is one of several nature preserves in the extreme southwestern corner of Massachusetts noted for their scenery. It is adjacent to the 4,000-acre (1,600 ha) Mount Washington State Forest, as well as New York's 5,000-acre (2,000 ha) Taconic State Park. Bash Bish State Park consists of numerous gorges and an eastern hemlock ravine forest. The slopes around the waterfall are covered by forests of trees such as maple, oak, and beech. Wildlife includes the timber rattlesnake, the peregrine falcon, bobcats, black bears, and porcupines. The park's recreational opportunities include fishing and hiking – but swimming and climbing near the falls is prohibited. However, swimming is permitted in the rock pools and streams that the falls drain into. Leashed dogs are allowed on the trail and at the falls. The falls can be reached via a moderately strenuous, half-mile, downhill trail. In all, there are three parking areas with trails of different lengths that provide access to the falls. The park is open from dawn to dusk. ^ a b "Bash Bish Falls". Geographic Names Information System. United States Geological Survey. ^ a b "Bash Bish Falls State Park". The BerkshireWeb. Retrieved January 12, 2014. ^ a b c d "Bash Bish Falls State Park". MassParks. Executive Office of Energy and Environmental Affairs. Retrieved July 16, 2013. ^ "Bash Bish Falls". NewEnglandWaterfalls.com. Retrieved January 12, 2014. ^ "Bash Bish Falls". World Waterfall Database. Retrieved January 12, 2014. Wikimedia Commons has media related to Bash Bish Falls State Park.